An extraordinary look at human disposition towards obsession and manipulation in an innovative crime graphic novel based on real events. Young journalist Andrea has been tasked with writing an article about an unsolved case from several years ago, which had gripped the entire nation. At the centre of the case was an adult woman who pretended to be an 11 year old girl and later in Denmark disguised herself as a boy of the same age. More and more mysteries piled up, conspiracy theories changed every day. Abuse, the influence of a powerful cult, threads leading to the highest levels of society. Andrea is consumed by the investigation, she forgets about her private life, her boyfriend Jakub, she turns the wall of her apartment into a board full of names, events and connections. With each new fact a new possible scenario emerges only to be quickly disproved. Every answer she discovers leads to more questions. Andrea is lost in the never ending labyrinth but she cannot stop searching for the truth and when she finally thinks it’s within her grasp, she has to ask herself how much she is willing to sacrifice. 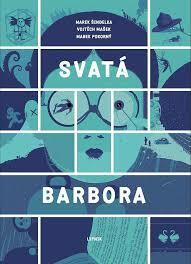 Saint Barbara is based on real events surrounding one of the most complicated criminal cases in modern Czech history, which was uncovered by chance after footage of the abuse of a young child was caught by a neighbour trying to set up a video baby monitor. Marek Šindelka (b. 1984) studied Cultural Studies at Charles University in Prague and screenwriting at the Prague film academy, FAMU. His debut poetry collection, Strychnin a jiné básně (Strychnine and Other Poems, 2005), won the Jiří Orten Prize for authors under thirty. He has published two novels and two short story collections since, which have been published in six languages including English and Dutch and have won two Magnesia Litera Awards. Vojtěch Mašek (b. 1977) is a comics writer and artist, author of film screenplays and theatre plays. His comics have received eight Muriel Awards and two have been published abroad. The film Křižáček (Little Crusader, 2017), which he co-wrote received the main award at the Karlovy Vary International Film Festival. Mašek is the author of the internet hit Recykliteratura, which builds on the avant-garde tradition of associative montages using photographs and texts found in books and magazines. Marek Pokorný (b. 1983) started creating comics more actively after discovering the internet community around the website Comx.cz, where he published a semi-autobiographical comic strip series. He took part in a figural drawing workshop lead by Boris Jirků and Radek Petříček and later studied classical animation at Film School Zlín. With the Ašta šmé group he authored the comics Silnější než někdo (Stronger Than Some) from the Nejisté domovy (Uncertain Homes) series about institutional and foster upbringing.